100% dairy free. Organic plant based drink. Plant based alternative. No refined sugar, emulsifiers or stabilisers. Gluten & soya free. Non GMO. Vegan. Bold Taste - Fewer ingredients, nothing added. Big Ethics - Always organic, responsibly sourced and produced No Preaching - It's not about perfection, it's about balance Why the Y? It's made from plants, not cows. So it's 100% dairy free. 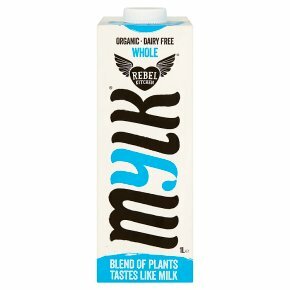 Mylk® What we all really want from a dairy free alternative is that it tastes & looks just like real milk. Right? We couldn't find one, so we made one! How do we make it so mylky? Coconut cream for creaminess Himalayan salt for savouriness Brown rice for sweetness Cashew for earthiness Nutritional yeast for grassiness We keep it simple, nothing added. No emulsifiers or stabilisers - so some natural separation may occur. How to mylk® it Splash it, pour it, gulp it, foam it, bake it Shake well.